The Royal Navy is testing just how much robot craft can do by themselves in military exercises off the British coast. Operation Unmanned Warrior 16 is a chance for allied nations and the defense industry to show off their latest maritime autonomous systems, as part of a broader military exercise called Joint Warrior. "Fire and forget" torpedoes capable of homing in on the noise emitted by a target -- then sinking it -- have been around since World War II, but the systems involved in this exercise are less offensive. More than 50 craft are taking part this week, including uncrewed helicopters and underwater vehicles, and an autonomous rigid inflatable boat (RIB). 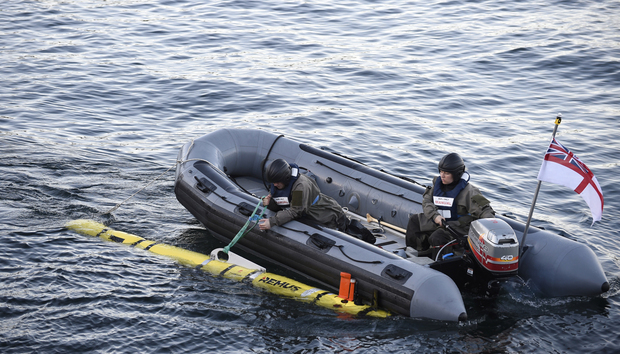 They will perform tasks such as surveillance, intelligence-gathering and mine countermeasures. Some of the craft are operating out of the British Underwater Test and Evaluation Centre on the coast of Scotland. The center conducts trials year-round for the U.K. Ministry of Defence, and during the exercise will demonstrate three of Unmanned Warrior's five themes: command and control, mine hunting, and hydrographic survey. Among the craft under test are Remus 100 and Remus 600, which use sonar beams to locate mines and to map the sea bed, and the Blue Bear Blackstart fixed-wing uncrewed aerial vehicle, which serves as a communications relay when the other craft are out of direct radio range of the base. A key part of the exercise is to determine how the different autonomous craft can be made to interact with one another, whether relaying signals or giving shorter-range craft a ride to and from the operations area. Some of the underwater mapping craft can run missions of up to eight hours without human intervention -- longer if another autonomous vehicle picks them up and carries them back to base. At one stage of the exercise nine autonomous craft were interacting with one another to complete their missions, the Navy said.